Just like rationalism forms the basis for Western medicine, the Taoist philosophy of yin-yang forms the basis for Traditional Chinese Medicine (TCM). While many people have heard the term yin-yang or know it's famous symbol, few understand what yin-yang truly is, and even fewer people outside of an acupuncture school know how it relates to Traditional Chinese Medicine. 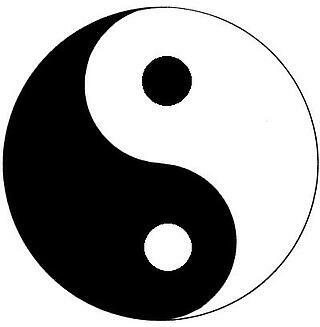 The typical yin-yang sign shows the interconnected duality of opposite forces. In Chinese philosophy, Yin-yang, which translates into “dark-bright,” describes the notion that everything in nature consists of two paradoxical phases or energies. In Traditional Chinese Medicine (TCM), the concept of Yin and Yang serves as the foundation for understanding health, as well as diagnosing and treating illnesses. Yin-yang is first referenced in the I Ching (Book of Changes), which was written around 700BC. According to it, all phenomena is composed of two opposite, but mutually interconnected forces, known as yin and yang. An ancient representation of yin-yang. The dual relationship of Ying and Yang demonstrates that everything in the universe exists as connected and complementary, yet opposite elements. The table below demonstrates many of these relationships. 1. Opposites- Yin and Yang are Opposites. A common yin and yang relationship is day and night. While opposites, they can only be understood as a relationship. For example, Darkness is relative to Ying, while Yang is relative to Light. The balance between the two is always shifting and progressing in a cyclical fashion. 2. Interdependent- While opposite, Yin and Yang are interdependent. One cannot exist without the other. Yin and Yang are mutually dependent on each other. One cannot exist without the other. Everything that has yin, must have yang, and vice versa. 3. Mutually Transformative-Yin and yang are constantly in a state of flux and affect each other. If one changes, the other follows. Nature, by definition, cannot be static. Just as a state of total Yin is reached, Yang begins to grow. For Example: tthere is no day without night. In terms of the human body, yin is associated with the lower parts of the body, while yang is associated with the upper body and back. 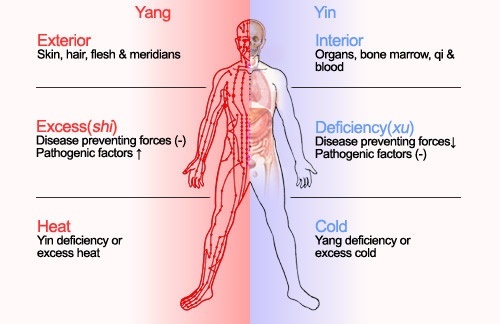 Given yin and yang’s interconnectivity, diseases are not seen as entities separate from the body, but instead are understood as states of yin and yang imbalance. 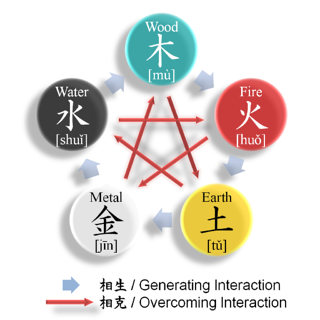 In Traditional Chinese Medicine, this interconnectivity is understood as a group of four opposites, collectively known as the Eight Principles. The table below shows the inverse relationship of yin-yang. Yin and yang are in constant flux. If one becomes unbalanced in the body, illness occurs. For example, since yin is cold, an excess of yin can cause illnesses such as insomnia and dry-mouth. Conversely, a yang deficiency can cause cold limbs and a sickly-complexion. Good health then, is maintained by balancing yin and yang. How yin and yang is manifested within the body. While the change of yin and yang may seem random, they actual follow a pattern known Xu Xing or the Five Phases, which shows how and when yin will shift to yang and vice versa. Typically, Xu Xing is used to describe the change of seasons and states of elements. For example, Spring giving rise to Early Summer, which turns into Late Summer, which then becomes Fall, then Winter, then Spring again. 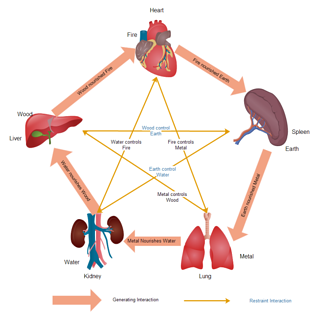 In terms of the human body, the organs follow a similar Wu-Xing pattern, called Zang-Fu. Zang refers to organs that are yin in nature. They are the pericardium, heart, liver, spleen, lung, and kidneys. Fu refers to organs that are yang. They are the triple burner, small intestine, large intestine, gall bladder, urinary bladder, and stomach. Each zang has a fu, and every zang-fu pair corresponds to one of the five phases. The diagram below better explains this relationship. The chart below shows the analogous relationships between the Xu Xing and Zang-fu organs. Xu Xing will be described in more thorough detail in an upcoming article. For now, the importance is to demonstrate how the concept of yin-yang serves as the philosophical foundation of Traditional Chinese Medicine. If learning about the relationship between yin-yang and the human body interests you, then perhaps you should consider a career in Oriental Medicine and acupuncture. Download our career guide below and check out our main program page. Acupuncture and Massage College was the first acupuncture school in Florida and is located at 10506 N Kendall Dr, Miami, FL, 33176. To request more information, call us at (305)595-9500 or email admissions at admissions@amcollege.edu.